Mayor Bloomberg is expected to announce on Thursday his quest to overturn voted-in term limits in a bid for a third term, painting himself as indispensable to New York City. He gets away with so much, with no accountability or real criticism in the press or from other politicians, why not this? Why not… ? because I think at last our CEO Mayor has overreached. You’ve got to read the reader comments on the New York Times’ blog’s story. The Times can try to spin Mayor Bloomberg’s popularity any way they choose in article after article but when you get right down to it, most New Yorkers know the true deal with this Mayor and are extremely critical of him. Fellow billionaire Ronald Lauder — who founded an organization called New Yorkers for Term Limits and took out newspaper ads a few weeks ago condemning any change in term limits — remarkably reversed course today. He now says he supports Bloomberg staying on as Mayor. Well, isn’t that convenient. Another great set of reader comments. The New York Times larger story is here. Let Ronald Lauder know how you feel about this most blatant disregard of principle. With Lauder, a billionaire himself, Mayor Bloomberg clearly doesn’t have to buy him off but he can choose to reward him in other ways in their mutual circles. Only another wealthy man or organization could provide an obstacle to Mayor Bloomberg’s aims by, for example, taking out newspaper ads condemning his actions. With Lauder out of the way, who will do this? And if the New York daily newspapers all fall in line (it was reported recently that Bloomberg was meeting with their editorial boards about his third term quest), then … isn’t this just all so easy for CEO Bloomberg to pull this off? Except … can the people be swayed? That will be the true test. Contact New Yorkers for Term Limits via their Feedback form. 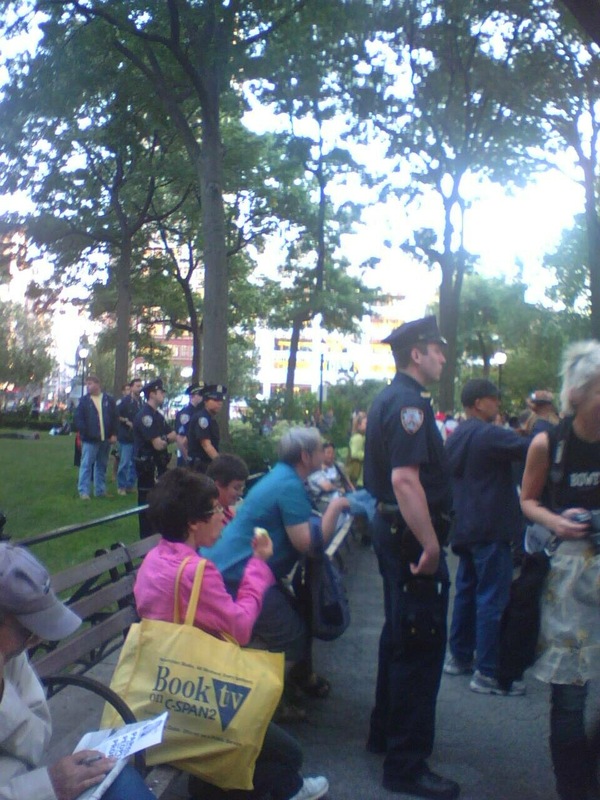 The New York Times on September 23rd reported that amidst the $1.5 billion budget cuts that Mayor Bloomberg “ordered” is a $6.5 million cut from the Parks Department. The cuts begin NOW in the current fiscal year which began July 1st and cover a two year period. Already deemed high (based on the extensive unnecessary tweaking of the Park) at the projected $13 million cost, the budget for the project is now somewhere around $25-$30 million. Here is an easy fix to the Parks Department’s dilemma of where to cut costs. It is the perfect way for the Parks Department to avoid firing workers and evade the further neglect of the parks themselves ** while ** providing the optimal opportunity to save face with the millions of New Yorkers and Village residents who, as they’ve learned of the City’s plan to overhaul this historic public space, ask themselves – WHY? Voila! Instant easy fix. Let’s begin preparing the memo. Update 9/26: New posts resume Monday 9/29. Takin’ a little breather to recharge. But there’s lot more to come. ! I’ve wanted to write more about Yankee Stadium (and I will). For the moment, here’s a still-relevant recycled post from May 25th: Time and Cost Rise for Yankee Stadium Parks in the South Bronx. As the [New York Times] article notes, “The stadium is being financed by the Yankees with city subsidies, while the eight new parks for the South Bronx, which range in size from .24 acre to 8.9 acres, are being paid for by the city.” (We give away 2 parks to a private corporation and the City pays to rebuild them.) The cost is now projected to be $174 million; the original estimate was $95.5 million. 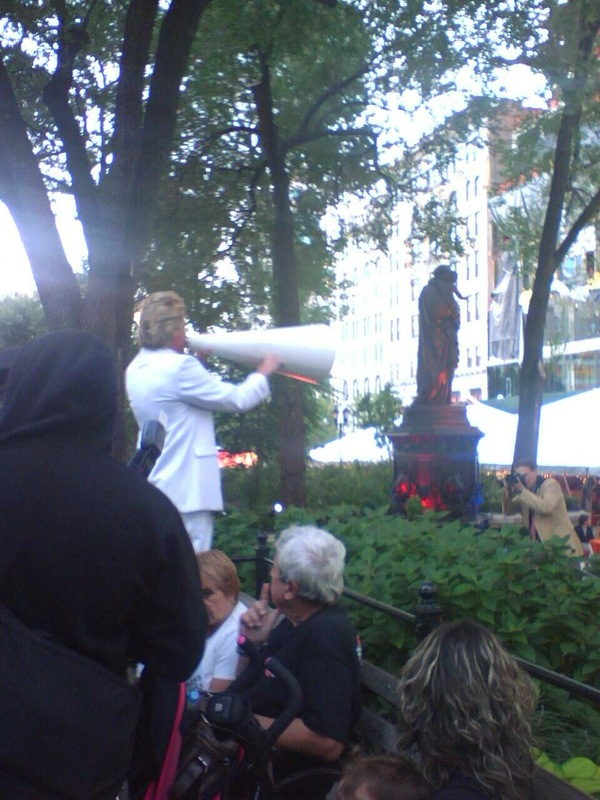 Union Square was the locale of some festive action last night opposite Union Square Partnership’s Harvest in the Square! 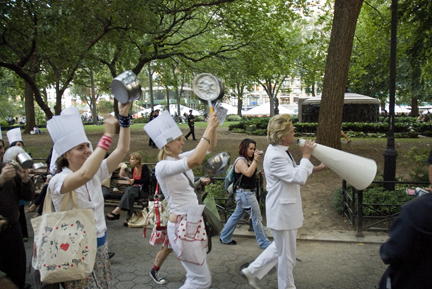 Lots of citizen chefs, creative chants, pots, pans, and banging on them (our illustrious Parks Commissioner Adrian Benepe was spotted speaking at this large takeover of our public space), and two arrests including Reverend Billy (not sure what the charges were – something to do with attempting to re-claim the right to speak out in a public place), as well as some ‘disruption’ inside the gala event. More Monday! 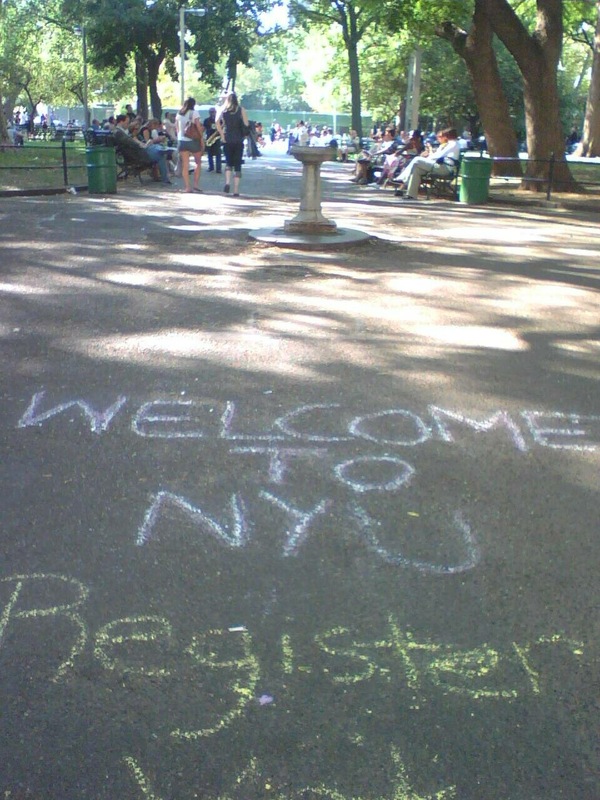 One Web Day will hold events at Washington Square Park Monday, September 22nd from 11:45 a.m. to 2 p.m. Events are being held in many cities across the U.S. and around the world. Events that day will feature: Moderator Sree Sreenivasan (Columbia Journalism & WNBC-TV), plus Tim Westergren (Pandora), Prof. Lawrence Lessig (Stanford), Craig Newmark (craigslist), Dharma Dailey (Ethos Group), City Councilwoman Hon. Gale A. Brewer, John Perry Barlow, Andrew Baron (Rocketboom), SJ Klein (OLPC), others. Purpose of this event: The theme this year: online participation in democracy. The internet is under pressure around the world – inadequate connectivity, censorship, and huge digital divides threaten its future. This rally is designed to raise awareness of these issues and to help us focus on how the internet has changed democratic involvement in America. To find out more, visit One Web Day. My opinion is that they need to consolidate the message a bit and get a pithier theme going – not to water it down but to make it clearer. It’s a great idea – promoting open source, making access for all, fighting corporate takeover and censorship, etc. etc. I’m sure they will have a big crowd! p.s. 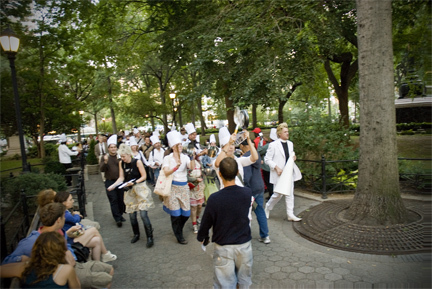 While you’re marking your calendar, don’t forget the Walking Tour, A Guide to NYC’s Redesign of a Perfect Public Space, hosted by Washington Square Park Blog and Washington Square Community Improvement District this Saturday, September 20th, 1 p.m. at the Arch!